Are you ready for your dose of cute for the day? Whether or not you are, these kittens and their mama are coming for your feelings. Cate, a foster cat from the Vancouver Orphan Kitten Rescue Association, had had six kittens less than two months before the video below was taken. 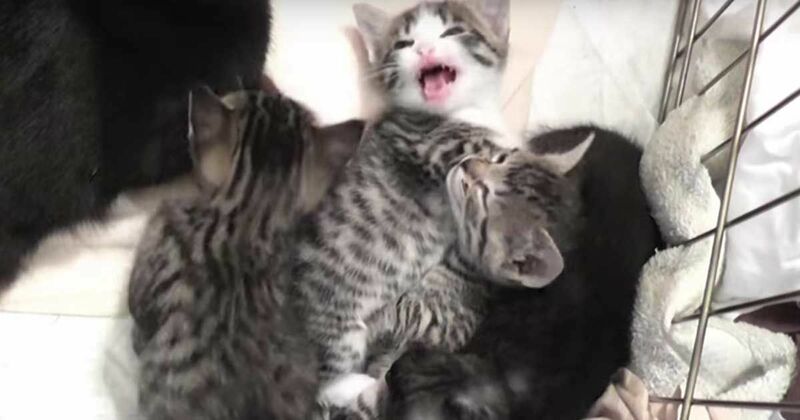 The seven-week old kittens, gathered around Mama Cat, were found adorably meowing for her attention in the video. Pam Johnson-Bennett from Cat Behavior Associates explains that adult cats generally do not meow at other cats, as they have other, more discreet ways of communicating. Adult cats only meow to get human beings' attention, when they want food, or to be allowed outside – or just love and affection. Kittens, however, have not quite mastered the art of subtle communication yet, and have a tendency to be very vocal about pretty much anything, as you can see in the video. Their mama, Cate, seemed to have decided to talk back to her children, even though she didn't need to. She emits a more subtle purr-like meowing sound, which when combined with the babies' high-pitched squealing, makes for a true symphony of cuteness. Watch the video below and make sure to SHARE with your friends!